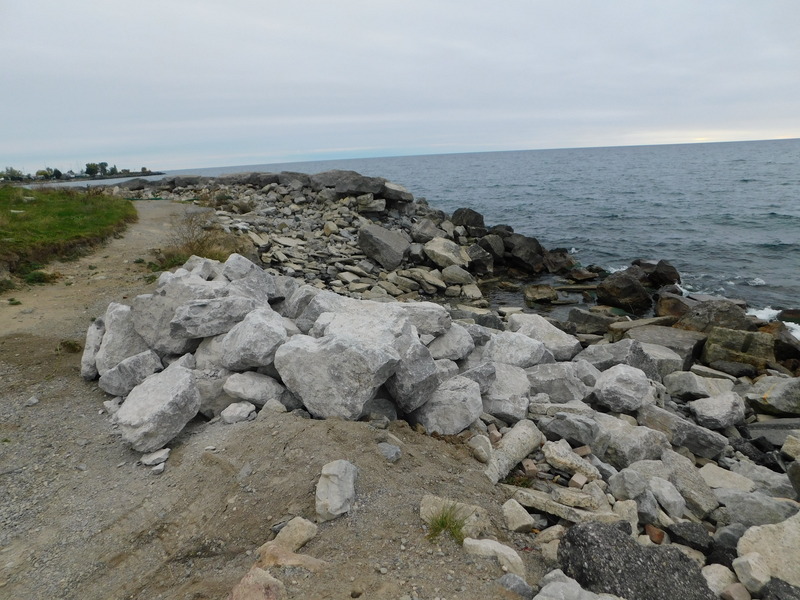 Toronto and Region Conservation Authority (TRCA), in partnership with the City of Toronto, is undertaking maintenance works on existing shoreline erosion control structures along Lake Ontario within Bluffer’s Park in order to protect against the hazards of shoreline erosion and address public safety concerns. 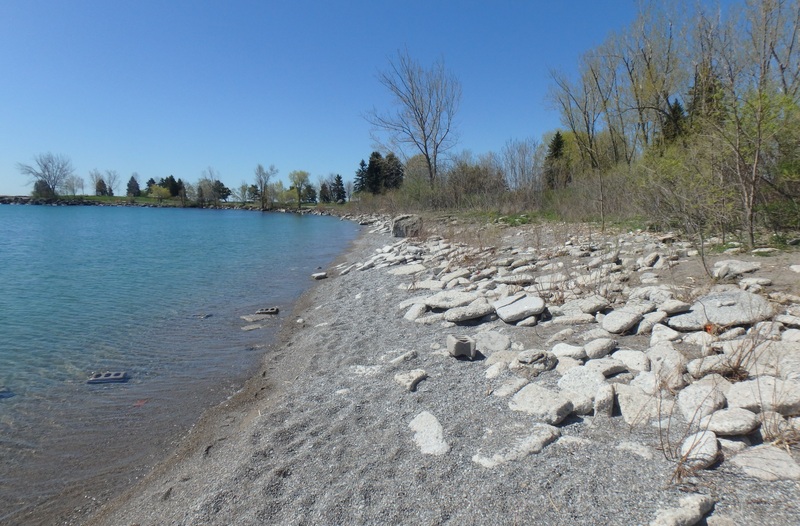 The project area is located in Bluffer’s Park, at 1 Brimley Road South, at the base of Brimley Road in Scarborough, City of Toronto. The area of concern includes the southernmost headland and adjacent beach, located at the southwest limits of the park on the north shore of Lake Ontario. Project area, including location of the headland and beach within Bluffer’s Park. Source: TRCA, 2018. 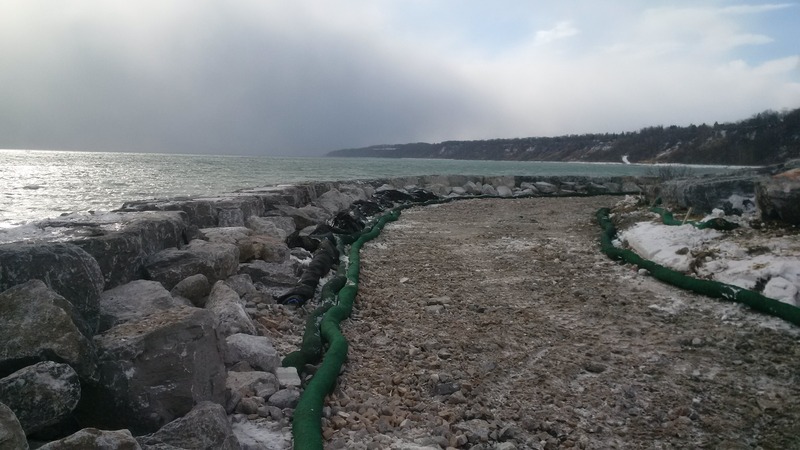 Bluffer’s Park was built as part of a large lakefilling operation from the early 1960s to mid 1970s, and includes a series of armourstone headlands, beaches, and revetments for erosion control protection. 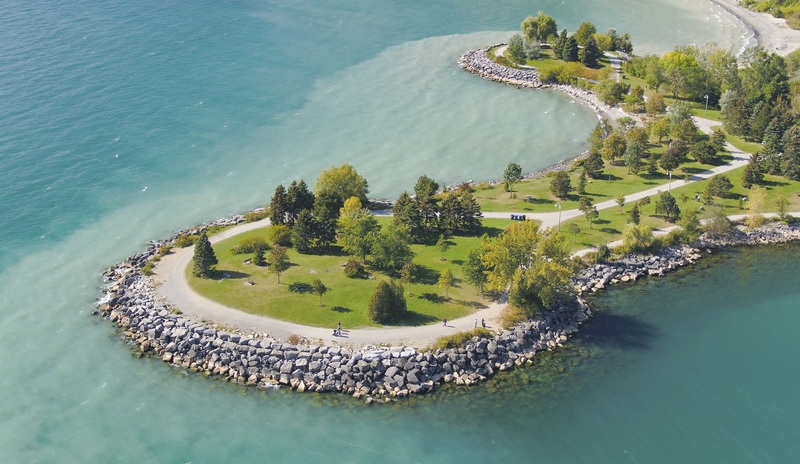 The landform has been used as a public park since its construction, and features formal walking trails, public beaches, marinas, and open green spaces that overlook Lake Ontario. 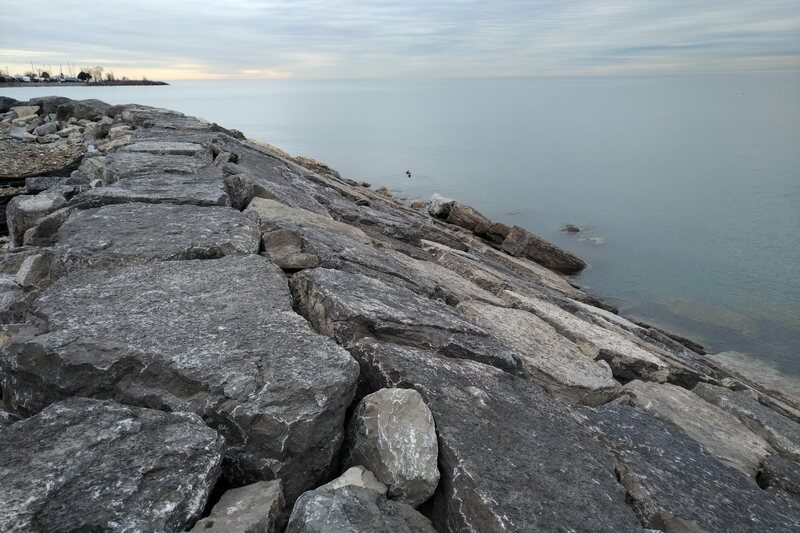 The project area includes the southernmost headland and its adjacent beach; the headland is lined by an armourstone revetment and the beach is constructed of a mix of cobble, gravel, and concrete rubble material. 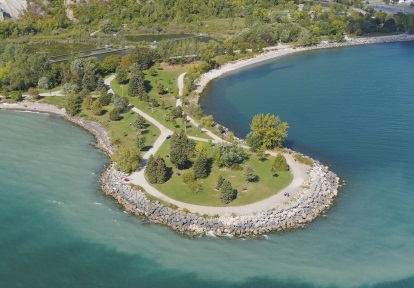 Aerial view of the south headland located in the project area at Bluffer’s Park. Source: TRCA, 2017. 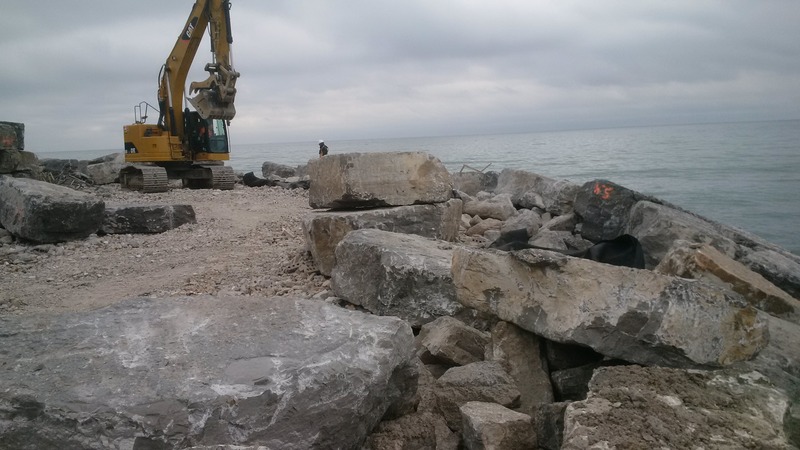 View of the cobble, gravel, and concrete rubble beach within the project area at Bluffer’s Park. Source: TRCA, 2017. 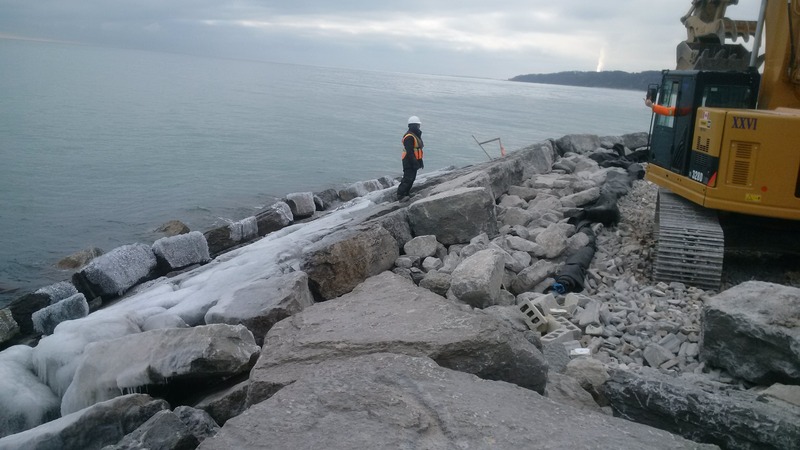 In 2006, TRCA began conducting annual inspections of the structures within Bluffer’s Park as a part of the Erosion Risk Management Program (ERMP). The ERMP has assessed the headland structure as at-risk since 2010, and in failing condition since 2015. The beach has been listed as a failing structure since 2010. In 2017, a weak spot was identified at the southern tip of the headland, where continued wave action resulted in the loss of much of the structure material. 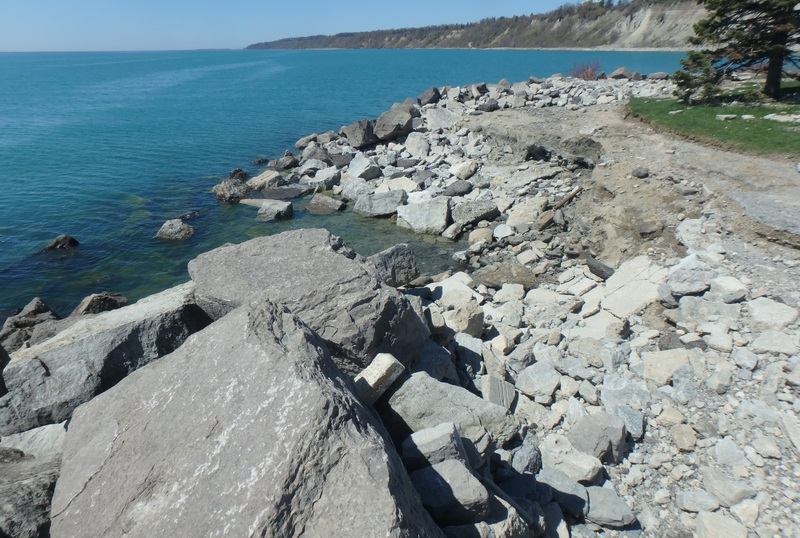 Weakened area of Bluffer’s Park south headland where rock material was lost from continued wave action. Source: TRCA, 2017. On April 14-15 2018, the Toronto Region experienced a severe ice storm which caused extreme wave action in Lake Ontario. 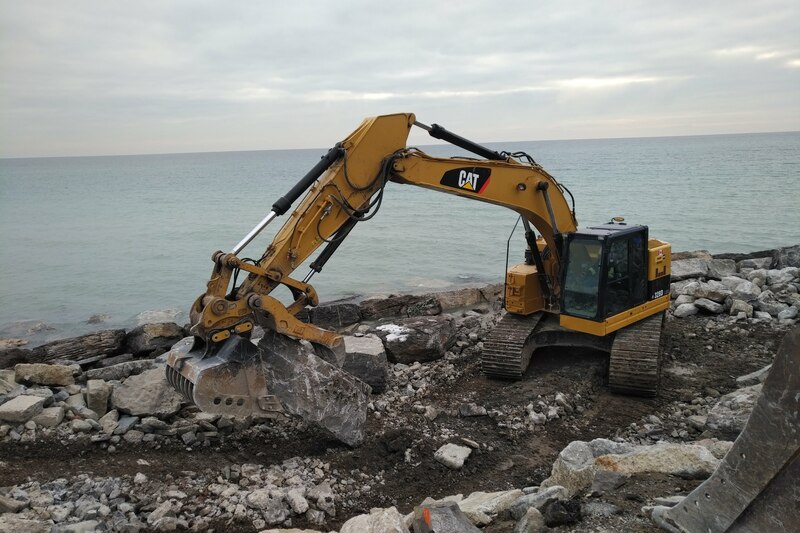 The waves caused significant damage to the headland and beach, washing large amounts of stone material into the lake and onto the park tableland, and scouring the shoreline. The wave activity from the storm resulted in the complete collapse of the weakened portion of the headland. The headland has been closed off to the public as it is a safety hazard in its current condition. 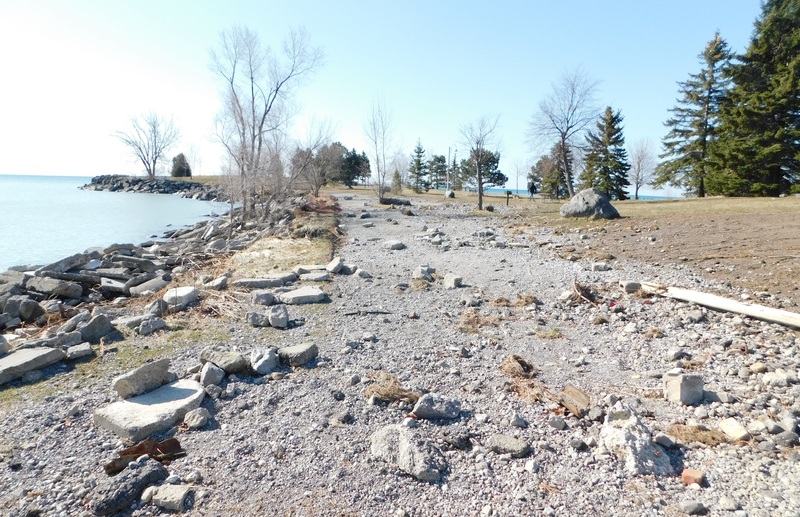 Damage to Bluffer’s Park south headland following April 14-15 2018 ice storm. Source: TRCA, 2018. Material washed ashore from the beach during the April 14-15 2018 ice storm. Source: TRCA, 2018. In the spring of 2018, TRCA retained Riggs Engineering Limited to develop engineered design solutions for repair of the damaged structures. An interim design to temporarily stabilize the headland while a long-term solution can be developed is currently underway. The interim solution will be focused on the displaced portion of the headland and will utilize material that can be incorporated into the long-term solution. The long-term solution will include repair of the whole headland as well as the adjacent beach. Interim works were completed in January 2019 and involved the placement of armourstones in the large failure section and in nearby voids. These works were designed to provide temporary protection to the parkland for the winter and spring months when ice and wave action place the structure at increased risk for further damage. The interim solution is intended to prevent further damage to the park until the long-term solution can be implemented. 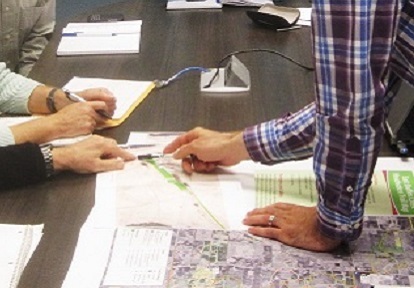 The scope of work for 2019 includes the completion of detailed designs for the long-term solution, which will include the repair of the headland and the adjacent beach. 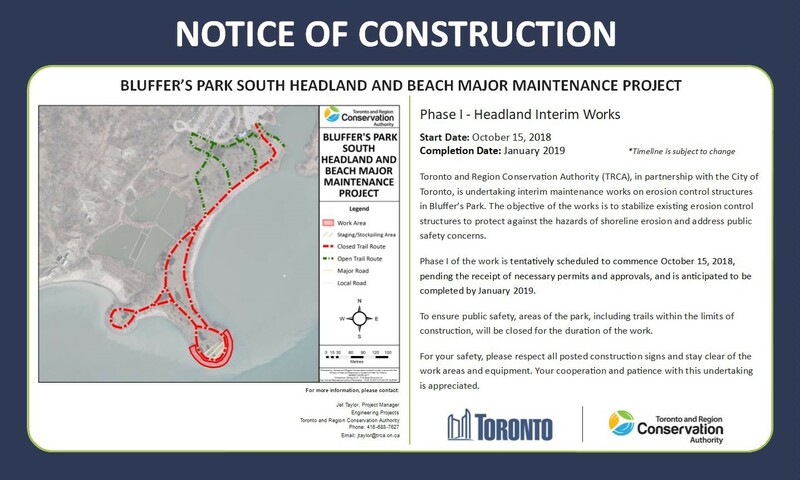 Implementation of repairs for the headland portion of the project area is scheduled for Summer 2019. All necessary permits and approvals will be obtained for the implementation of works prior to construction. headland to stabilize the structure while a long-term solution is developed. 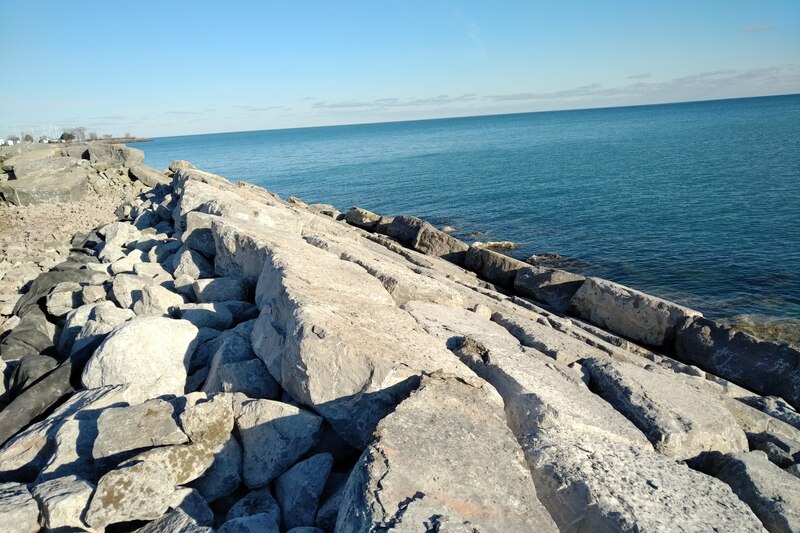 Implementation of repairs for the beach portion of the project area tentatively scheduled for the Summer of 2020. Construction details will be updated when Phase II of the project begins in summer 2019. 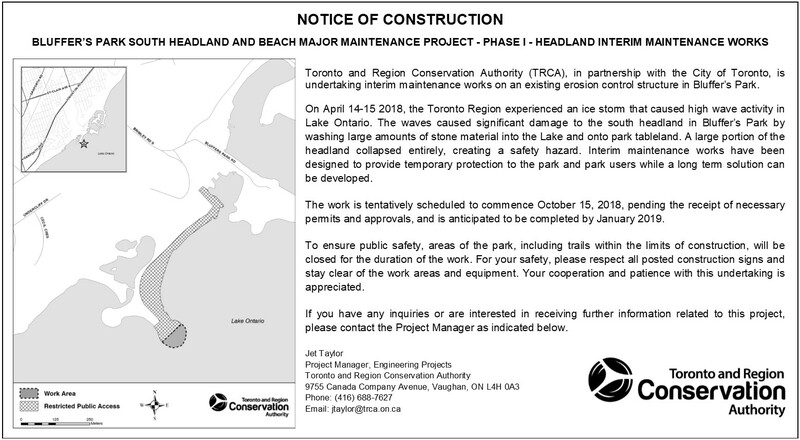 Until construction commences, the headland will remain closed to ensure the safety of park users. The closed area is shown in the following map. 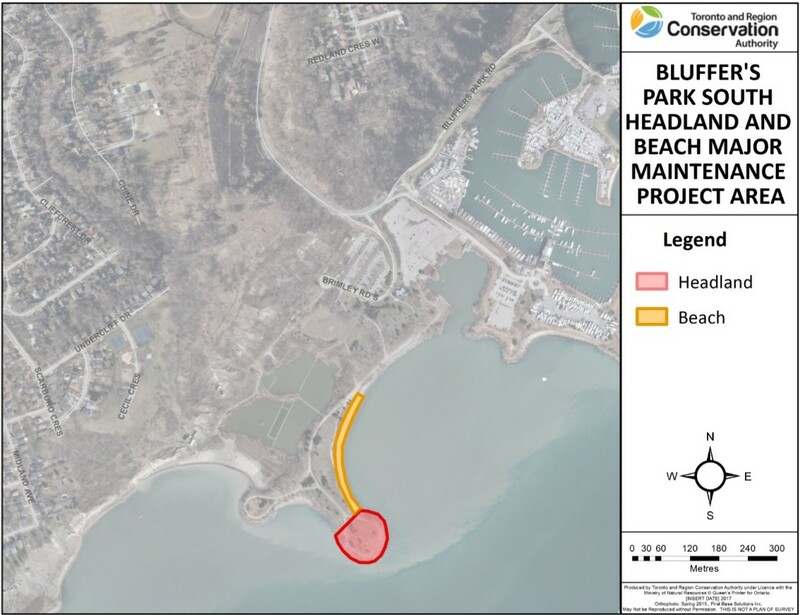 Notices of Construction were published in the October 18, 2018 edition of the Scarborough Mirror and the October 30, 2018 of the Bluffs Monitor to inform the public of the project and construction timelines. 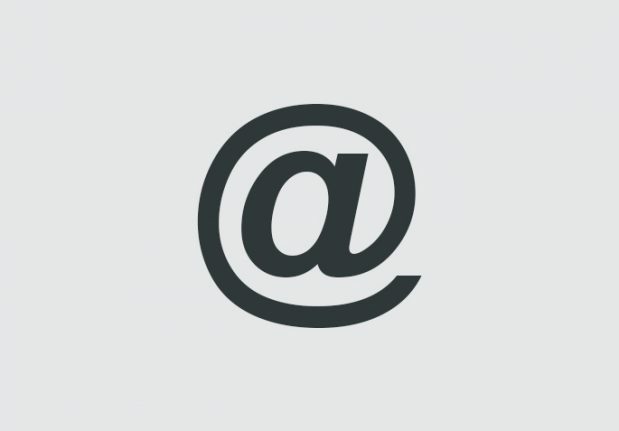 To see the notice, follow the link below. Notices of Project Commencement signs were installed at the project site prior to construction of the Phase I. The signs were removed in January 2019 following completion of the interim works. To see the notice, follow the link below. 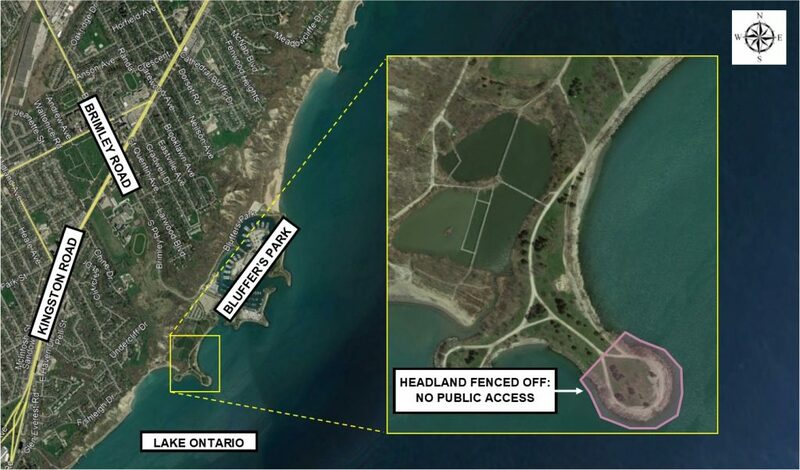 Construction fencing has been installed, restricting access to the headland and the access route as shown in the Notice of Construction. Materials have begun to be delivered to site. 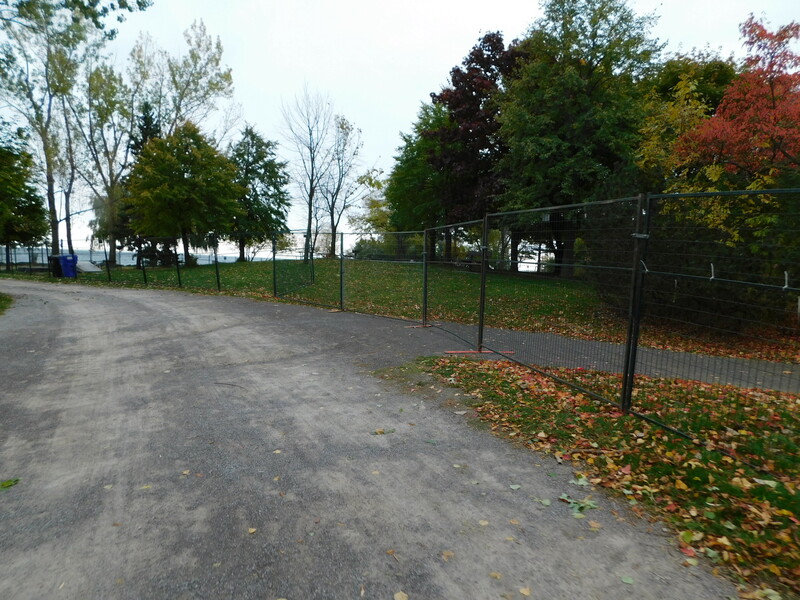 Construction fencing at Bluffer’s Park South Headland. Source: TRCA, 2018. Armourstones have been placed in water and works have now begun above the water line. Placement of armourstone above the water line. Source: TRCA, 2018. The second layer of armourstones has begun to be placed. Placement of second layer of armourstone. Source: TRCA, 2018. Interim works are nearing completion, with the placement of the final armourstone tiers over the rip rap core. Progress on interim works. Source: TRCA, 2019. Interim works have been completed. The area remains fenced off and some structure materials have been left on site in anticipation of the implementation of the long-term solution. Completed interim works. Source: TRCA, 2019.